Friday morning came cloudless and cold making reaching out from the warmth of my sleeping bag to light the tilley quite unpleasant. Not wanting to waste time on such a good day, we scoffed breakfast and pulled on our harnesses. While Alex and Tom spent the morning hydrating and filling flasks, Sune and I roped up and headed out to an interesting looking set of crevasses and pressure ridges a kilometre or so away. Early Antarctic authors talk a lot about the snow conditions as the state of the surface makes a big difference to the ease of travelling. Plodding through two days’ fresh snow was hard work as each step sank to knee depth, draining energy fast. 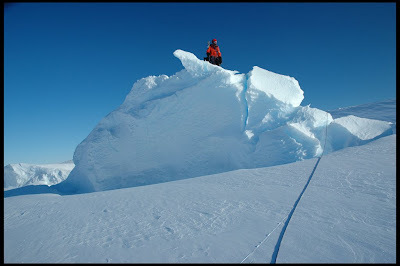 Things got easier as we entered the crevassed region of blue-ice as now our crampons could grip a solid surface and we could walk normally again. We spent a good hour exploring the beautiful area of ridges and valleys before heading back, this time with me in the lead forcing my way up steep soft snow back to the tents. After lunch, while Alex, Tom and Sune headed out I sat on the top of Stoney Berg, taking photos and revelling in the feeling of being totally isolated. 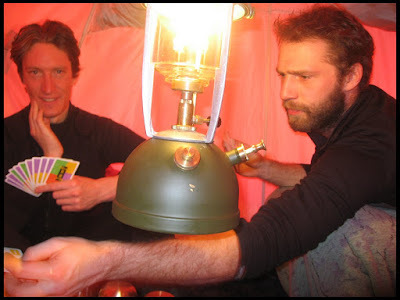 We spent the final evening eating in the tent and swapping stories of where we’d been and what we’d seen. After much discussion (and a little port), we decided to name the principal valley ‘Desperation Gulch’! We also argued over the name of a particular 80’s pop song featuring a long and self-indulgent drum solo. Dean settled the matter at the evening radio schedule by playing Phil Collins ‘In the air tonight’ over the HF radio. As HF can cover vast distances, there could have been a few very puzzled radio hams listening on the air that night! Packing up camp took longer than expected due to the mounds of snow covering sledges, tents and boxes, but after three hours the skidoos were linked up and we set off. Riding back was straight forwards, except for the one steep slope that had caused problems on the way in causing trouble on the home leg too. Sune lead down the slope, accelerating so his sledge wouldn’t ram him. As we were travelling linked, I had to accelerate to keep up, so went over the blind brow faster still. Coming over the crest, the rope to Sune’s doo led straight across two large mounds, forcing me to throw my weight back and blast the throttle to make the doo jump as I wanted it too, rather than of its own accord. Amazed that the sledge had survived, I pulled up at the base of the slope to watch it tip, right at the last moment, on the flat! From there on it was easy going and we arrived back just in time to wash off the stench of paraffin and sit down for dinner. As we unpacked, hung sleeping bags over doors to air and sorted racks of climbing kit on the floor, I smiled to myself as the base started looking very familiar. Much like an old student house in Bangor. Aye up lad, sounds like you're having a great time down there, maybe you should get BAS to link your blog to their recruitment website.